With the success of his iconic adaptation, “Batman: The Animated Series” behind him, creator Bruce Timm was asked by Warner Bros. in 1996 to produce a companion series to the darker crime drama. The natural jumping off point from Batman was, of course, Superman, the equally recognizable and ever immortal character from DC Comics. With “Batman: The Animated Series” ensuring the success of DC translating in to the animated medium, Superman was a welcome change of pace for the medium Timm had helped innovate for the decade. It was also a welcome reboot for Superman fans who wanted the Man of Steel brought in to the decade. When “Batman Beyond” was introduced in 1999, fans of old and new were given a peek in to a Batman for a new generation while also exploring what happened to Bruce Wayne’s legacy many decades in to Gotham’s Future. When the series took off, fans were able to see that the legacy of the Joker lived on, as he inspired one of future Gotham’s most violent army of gang members “The Jokers,” however we were never given a definitive explanation as to what happened to the clown prince of crime. “Return of the Joker” holds true to its title, spending a feature length narrative explaining what happened to the Joker and how he left a lasting scar on Bruce Wayne and his family. Sue me but it’s pretty cool to be seeing a Hispanic man playing Superman for once; if only for one time in an Elseworlds tale. “Gods and Monsters” is set in an alternate DC Universe that has its own Batman, Superman, and Wonder Woman, and damn it they’re not the clean cut superheroes and titans we know them as. Imagine an alternate fate for the trio of titans. What if Zod programmed his DNA in to Superman and Superman was taken in by a Mexican farming couple rather than Kansas farmers. Imagine if Wonder Woman was from the new gods, and Batman was actually a bat like man who sucked people’s blood. With Batman celebrating his 75th anniversary this year, I thought it’d be a good idea to remember Bruce Timm’s classic animated series about the Dark Knight. No animated series since has gained such acclaim and love from fans of all kinds. Whether you’re a nineties kid, a Batman fan, or an animation buff, there’s no denying “Batman the Animated Series” set the bar high. It was a masterpiece of storytelling, characterization, and mythology, all the while giving Batman a new dimension. It didn’t pander to kids, and often provided mature, complex, and morally gray tales of evil, crime fighting, and Bruce Wayne’s struggle to maintain his humanity under the cape and cowl. These are our top five favorite episodes of “Batman: The Animated Series,” what are some of your favorites? Apparently now there are multiple colors of the Lantern and multiple sources of emotions that can fuel power. And none of it has to do with merchandising. 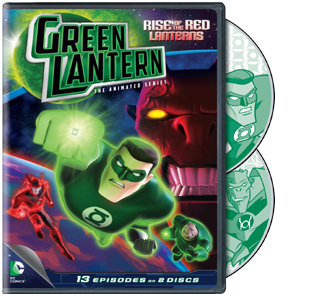 That bit if cynicism aside, Green Lantern gets his much overdue animated series from the Cartoon Network here in America and leads what is a pretty entertaining action science fiction series overall. It’s not as sophisticated as “Batman” or “Justice League” and rarely exciting as “Batman Beyond,” but as a Bruce Timm byproduct it serves its purpose as entertaining science fiction fodder that thankfully pretends the movie never existed.